AEAs Impacting Lives | This site provides information and comments about Iowa's AEAs. 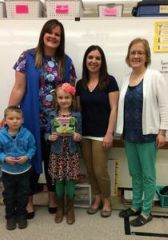 Photo: Kalvin (Kambrie’s brother whom she plays school with at home), Katen (Kambrie’s mom), Kambrie, AEA speech-language pathologist Lindy Laubenthal, and Mrs. Julie Swenson. 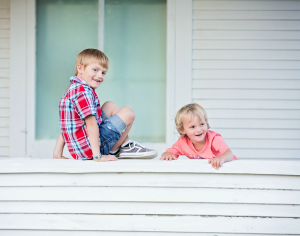 Article written by Julie Swenson, kindergarten teacher at Hartley Elementary. Comprehensive Intervention Model, or CIM, training goes beyond the CIM intervention group. As a classroom teacher, I was able to use the knowledge I gained from CIM training this year to work collaboratively with Kambrie, a selective mute student in my classroom, her mom, and our school’s speech-language pathologist, Lindy Laubenthal, to help Kambrie learn to read. I loved the Phase 1 and Phase 2 lesson plan layout and CIM language so much that I used it with all my classroom guided reading groups. Kambrie was a student in one of those guided reading groups. At the beginning of the year, Kambrie was reluctant to participate in any of the literacy activities that involved speaking. Over the course of the year, she slowly gained the confidence to participate in the classroom by first smiling, then gesturing, to eventually raising her hand to answer questions in her own way. I had to be very creative this year. I used videos that mom made at home of Kambrie reading the little books we use in her guided reading group. I could then analyze the reading and plan how to help her. On several days after school, mom and I worked together to assess her on the FAST and some of the report card assessments. As the year progressed, I mentioned to Lindy Laubenthal how mom and I were exchanging videos of Kambrie reading. Lindy started videotaping Kambrie’s readings in the speech room. Then we brainstormed ideas of how to get Kambrie’s voice heard in the classroom. Before classroom centers, Lindy would take Kambrie upstairs and video her reading a book. Shortly after, they would both come down for classroom centers and Lindy would lead a small guided reading group using the CIM layout that I wrote up for her. When it was Kambrie’s turn to share a page of reading they would play the iPad video. Not only was Kambrie getting “CIM lessons” and language in the small speech center, she was getting it in another guided reading group with me. When it was Kambrie’s time to share her independent reading with me, I always asked if she wanted to read to me first. She would shake her head, “no.” So, I created another modification that worked! Kambrie would point to the words while I read the story. As I read, I would make a couple of mistakes and then think aloud how I fixed them so she could learn how to monitor her own reading and become aware of how to solve challenges when reading. Kambrie benchmarked at Independent Level D by the end of her kindergarten year!